Looking for ways to share screens with your friends, peers, or customers? These awesome free screen sharing tools might help! What screensharing tool do you use to share ideas and give feedback to someone? There have been a lot of tools popping up in the marketplace that handle screen sharing in different ways. Whether you work in marketing, sales, design, development, customer service, or anywhere else, it’s integral to our communication to share screens. It’s one of the fastest ways to teach, explain and make decisions in real-time. Thanks to screen sharing tools available on the market today, people can see and interact with each other’s screens and help get work done quickly. Seeing and controlling screens remotely has revolutionized how we talk with our peers, customers, and clients, saving us time and removing confusion. Since screen sharing tools are an important part of our everyday workflow, we decided to test out some of these tools available on the market right now and compile a list of the best ones. Hope you benefit from these as much as we have! Let us kickstart our list by first getting the most famous free screen sharing tool out of the way. Skype, owned by Microsoft, is a widely popular telecommunication app that lets you chat and video call with anyone all around the world. Used by millions of teams worldwide, Skype is the go-to communication app in the majority of offices. Thankfully, Skype offers screen sharing capabilities which allow users to share screens with each other while they are on a call with one another. Apart from sharing screens, users can even share photos, videos, and files up to 300MB over Skype and quickly find shared content in the chat gallery. If you’re already a heavy Skype user, it makes sense to start using it for screen-sharing purposes as well. Loom is trying to be a new kind of work communication tool that helps you get your message across through instantly shareable videos. Loom lets you record videos for any business purposes- whether you want to record a detailed video response to an email, share a video response to a customer question, embed video tutorials on your website and Bit.ai, share quick videos on social media, etc. With over 400,000+ people downloading it every single day, TeamViewer is one of the most highly reputed free screen sharing tools on the market. TeamViewer is available on all major platforms including Windows, Mac, Linux, Android, iPhone, and iPad, is available in more than 30 languages. Whether you work from home, are often traveling, work with a remote team, or work in customer support, TeamViewer has an array of collaborative features that catapult your productivity and increase customer satisfaction. Apart from screen sharing, Teamviewer has a bunch of awesome features like remote file sharing, remote printing, mobile device access (connect your mobile to a remote PC), cross-platform access, and much more! CloudApp is a visual communication tool that combines video walkthroughs, webcam recording, GIF creation and screen capture in an easy-to-use enterprise-grade app. CloudApp knows that creative collaboration can be tough, especially if you are working remote. Whether you want to explain a process step-by-step, annotate changes to be made to your website, or give visual feedback to your designer, CloudApp helps you do it all in a jiffy. It helps you boost the process of visual communication so that the message doesn’t get lost in translation. CloudApp’s easy to use and robust interface makes the process of sharing visual information a walk in the park. This is why CloudApp has quickly surpassed 2 million users worldwide and shows no signs of stopping! Another screen sharing tool, Anydesk facilitates collaboration and communication with ease. Whether you’re holding online meetings and presentations or working on the same document from the other side of the world, AnyDesk makes it easy for users to get work done without any hiccups. A lightweight tool (files size 1mb! ), AnyDesk has some neat features like built-in file transfer, the ability to record sessions, access restriction, ability to set up your own enterprise network and much more. AnyDesk makes it their primary focus to allow its users, a smooth screen sharing experience by providing high frame rates and low latency. This is why AnyDesk claims to be the remote desktop software of choice for areas with poor internet connectivity. A browser-based screen-sharing service, Mikogo doesn’t require any downloads. Users can easily connect via a web browser and start sharing their screen quick and easy. Apart from screen sharing, Mikogo also offers high-quality video and voice conferencing to conduct an online meeting with your clients or team members. There’s even a “Session Scheduler” to schedule your meetings in advance, so you never miss a beat. Apart from the web browser, users can also screen share via Mikogo’s iOS and Android mobile apps or their mobile’s web browser. Mikogo offers a free account, available at absolutely no cost to both private users and businesses. One of the most powerful free screen sharing tools on this list is LiteManager. LiteManger allows users to quickly and easily control computer desktop in real-time mode with full support for Windows, provides secure remote access to the file system, processes, and services of the remote computer. LiteManager also has built-in tools for creating network map, collecting technical data, ability to deploy and update using remote installation services, configure private ID router (NOIP) and many other features. The free version of LiteManger allows you to control up to 30 computers simultaneously free of charge! and even more computers if you have a license key! Even though it’s not one of the easiest tools to get around, the fact that its powerful enough to control 30 computers at once is a special feat in itself. Zoom video communications were named a 2018 Gartner Peer Insights Customers’ choice for meeting solutions! Whether you want to conduct an online meeting, video webinar, or just need to share screens with your IT team, Zoom is the tool for you. If you have a large team with whom you share screens or conduct meetings with, Zoom is the go-to tool. Its free account option lets you share screens with up to 25 participants and host an unlimited amount of meetings. However, each meeting can be only 40 minutes long. A fairly simple screen sharing tool, ShowMyPC is a company with a mission to provide free and integrated collaboration tools for all users. To start with ShowMyPC, you first need to download the free software. Users can then generate a password to send to other peers and start sharing their screens. Users can chat and take screenshots with the free service, but you need to pay a subscription fee if you want to share files, chat, collaborate on a whiteboard, voice conference, and more. MingleView claims to be the first ever free desktop sharing application with unlimited participants. It has no installation process and can simply be downloaded from their website. As straightforward as they come, MingleView screen sharing tool allows users to join a meeting & troubleshoot a PC with only a 6-digit magic meeting ID. MingleView also claims to offer the highest screen quality offered compared to any other commercial remote control solutions. MingleView provides a secure peer to peer connection built over SSL with no port forwarding or special firewall configuration required. All in all, MingleView is fast, easy, and lightweight free screen sharing tool that anyone can get on board with quickly. 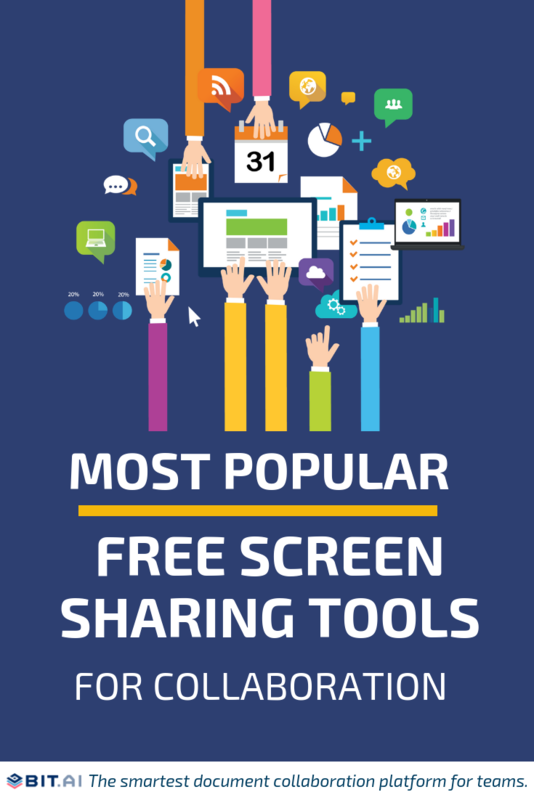 So there you have it folks, top free screen sharing tools on the market right now. All of these tools offer a wide variety of features, some more than the others, and are fairly easy to get used to. It majorly boils down to your use case and personal preference. Which one of these tools did you like the most? Did we miss out on your favorite free screen sharing app? Tweet us @bit_docs for suggestions and feedback.